Professor Chandrika N Wijeyaratne assumed duties as the 18th Vice Chancellor of the University of Colombo on 12th April 2019. She is an alumnus and an academic in Reproductive Medicine and Endocrinology, Department of Obstetrics and Gynaecology in the Faculty of Medicine, University of Colombo since 1993. She is Senior Professor since 2010, having qualified with MBBS Second Class (Upper) Honours (1983), M.D Internal Medicine (1989) and Doctor of Medicine by Research (2003) from the University of Colombo. It is indeed serendipitous that Prof Wijeyaratne, the third academic from the medical faculty to hold the Office of the Vice Chancellor, will lead the University to celebrate the 150th anniversary of its pioneering faculty, the Faculty of Medicine. In addition to being a Commonwealth Fellow (1999-2000), she was elected as Fellow of the Ceylon College of Physicians and Royal College of Physicians London, and was awarded honorary fellowships by Sri Lanka College of Endocrinologists, College of General Practitioners of Sri Lanka and the Association of Physicians of India. Professor Wijeyaratne was the first Endocrinologist in Sri Lanka to be appointed to an academic position, and has the distinction of being a pioneer Physician in Women’s Health (Obstetric Medicine and Reproductive Endocrinology) in the South Asian region. With teaching experience exceeding 30 years she has left her mark on medical and postgraduate education by helping in the development of an innovative medical school curriculum and in inspiring a large number of trainees to enter the field of Endocrinology. She attends on women with complex endocrinopathies and serves as a clinical consultant for all pregnant women with severe endocrine and medical complications. Her contributions to the field of Endocrinology was celebrated internationally with the prestigious Laureate Award for International Excellence in 2017 by the Endocrine Society of USA – in its centenary year; the only such award to date for South Asia. This award in particular recognized Professor Wijeyaratne’s internationally pioneering work on the ethnic variations of polycystic ovary syndrome (PCOS) and her successful efforts to transform the management of diabetes in pregnancy in a resource limited setting. Professor Wijeyaratne has an unfailing research record with multi-sector and international collaboration and outreach. She has supervised research into a wide array of topics for over a dozen PhDs and MD by theses. She has real-time experience in pioneering her special interests, chiefly PCOS and Insulin Resistance in South Asians (topic of her DM thesis), fetal programming and intergenerational impact of metabolic risks, gestational diabetes and other complex medical disorders of pregnancy. Professor Wijeyaratne has over 75 publications in peer reviewed journals including high impact factor journals such as New England Journal of Medicine, Lancet and PLoS with h- index of 19 and i10 index of 28. She has wide experience in editorial governance and peer review of international journals. She conceptualized for the Sri Lanka Medical Association its flagship project –NIROGI Lanka (National Initiative for Re-Organizing General DIabetes Care) obtaining over $1 million from the World Diabetes Foundation to control and prevent diabetes and cardiovascular disease (CVD) nationally. Virtually every aspect of research, education, clinical practice and public health in Sri Lanka has been deeply impacted by Professor Wijeyaratne’s leadership. She has ably led many mature Professional Organizations and Academic bodies through her presidency of the Sri Lanka Medical Association (SLMA), Ceylon College of Physicians and Endocrine Society of Sri Lanka. She has co-ordinated and chaired several high profile academic bodies, namely the Specialty Board in Endocrinology of the Postgraduate Institute of Medicine, the Faculty of Medicine Colombo’s IRQUE project funded by World Bank, several National level Committees that includes the Special Program in HRP of WHO for enhancing Research in Reproductive Health in Sri Lanka and SLMA’s NIROGI Lanka Project since 2008, Subcommittee on Non Communicable Diseases (NCD), Women’s Health Committee, Diabetes Prevention Task Force since 2005 and more recently the Palliative Care Task Force. She is also the Sri Lankan Representative – International Society for Obstetric Medicine, since 2006. Professor Wijeyaratne has served on many international scientific working committees and affiliated organizations as an invited expert. These include the Royal College of Obstetricians & Gynaecologists London, International Consensus Groups on PCOS by ESHRE/ARSM, AEPCOS USA and more recently the expert group led by the University of Monash, Australia. She represented Sri Lanka in numerous Regional Meetings and Expert Committees on NCDs of the World Health Organization, the Research Triangle Institute, North Carolina, USA, presidential project of British Medical Association and the international organization ‘Women Deliver’. She is a Vice President of South Asia Initiative on Diabetes in Pregnancy (SAIDIP) and has served on the Nominations Committee for Eisenhower Fellowships in Sri Lanka. She is a Past President of the pioneering Zonta Club in Sri Lanka and served as a member of Zonta-International’s subcommittee for Golden Zs – an undergraduate leadership programmes for empowerment of women that she pioneered in South Asia. 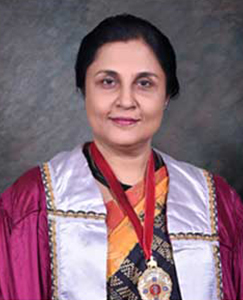 She has delivered numerous orations and keynote lectures to prestigious institutions that includes the Faculty Oration to her Alma Mater, Sir Nicholas Attygalle, Sir Marcus Fernando and Dr Murugesu Sinnettamby Oration of the SLMA, the inaugural Henry Rajaratnam Oration of the College of Endocrinologists and Commonwealth Medical Association. She has received global recognition as an invited speaker and resource person on many facets of Women’s Health and related issues in Sri Lanka, India, Bangladesh, Pakistan, Bhutan, Myanmar, China, London, Amsterdam, Australia, Hong Kong, Canada, Italy, USA, Denmark, Barcelona and Kenya. She has been engaged in a spectrum of activities related to supporting issues of national relevance that benefit society at large. These vary from policy formulation and planning, strategic implementation of novel initiatives and program management to inter-sectoral coordination, advocacy, health education and promotion, public engagement and community enhancement. She has spearheaded many social interventions at grass root level by engaging with multiple sectors along with undergraduate participation. She spearheaded with Zonta, a global women led initiative to empower vulnerable women, the building of houses and encouraging women towards self-employment for victims of the Tsunami in Seenigama, Southern Sri Lanka and for victims of war in Ariyalai, Jaffna in Northern Sri Lanka. She is married to Mandika Wijeyaratne, a fellow academic in the University of Colombo who is the current Chair-Professor of Surgery and they have a daughter Lihini and son Manuk, both medical graduates who are now pursuing postgraduate studies.